I have always felt that, once an art form starts examining itself, it is on the way down the plughole; art must involve itself with the world and only gets out the mirror when it has nothing left to say. Take a look at the so-called avant garde of the visual arts, literature and music of today and you will see what I mean (actually, the state of modern poetry most elegantly demonstrates my point but I would not inflict such garbage on my readers). Blogging is an art form, believe it or not - a brash newcomer in the world of literature where the writer has immediate response from his readers and puts himself on the line as a result. No hiding out in some New Hampshire log cabin for the blogger; he writes with the world looking over his shoulder and all his weaknesses on display! Which is a form of introduction to my subject today: the relevance of F1 blogging to the sport. As I have said, this is far too early to be looking at blogging, barely emerged from its infancy as it is, but certain revelations from the F1 powers that be this week have drawn my thoughts on the matter into a new understanding of what is really going on. This is all Doctor Vee's fault. He has written a scathing article on the absurd vison of the future from Martin Whitmarsh and Luca di Montezemolo - a world in which F1 is a spec series, the GP weekend is a funfair of irrelevant races only loosely connected with the main event and the teams become entertainment managers interested only in counting up the profits. What has shocked me is the fact that the nonsense emanates from FOTA, the association of F1 teams that we must all have hoped would prove a desperately needed counterbalance to the worst excesses of the FIA. The evidence so far suggests, however, that FOTA is nothing more than a lapdog of the FIA, intended only to assist it in the dismantling of F1 to replace it with some awful sort of freak show. How can the teams be serious in suggesting standard transmissions, wheels, brakes and rear wings? Are they really so little interested in the competition that makes F1 what it is? It seems incredible to me but two of the most important members of FOTA say it is so and I have to cope with it. And the only way I can do that is to look at the underlying attitudes of the people in charge of the sport. It has been obvious for years that Bernie is interested only in increasing the number of viewers, since this means more money in his pocket. He cares nothing for the quality of the viewers, whether they understand the sport or are likely to stick with it in the future; it is all about profits now. The revelation is that his attitude is shared by all those who run the sport - money is what matters and the contest between man and machine that lies at the heart of F1 is disregarded and treated with contempt. The show is everything, apparently, and the sport irrelevant. What this means is that the true enthusiast, the one who knows his history and understands the technical matters of engineering and driving, is actually an impediment to the entertainment managers of F1. The real fan is nothing but a pain in the rear end to them, since he whines on and on about the quality of the racing, the integrity of the FIA, the poorly written rules, the abject submission to the bean counters; they would happily be rid of us, dear readers, and look forward to a time when they can count the sheep through the turnstiles and attend to their shearing without a bleat of protest. I know that sounds dramatic but it encapsulates what is happening. Consider that the suggestions for the future have been made in all seriousness - did they really think we would accept such ideas with open arms? I cannot believe that. No, they knew full well that the enthusiasts would react with horror and my conclusion must be that they do not care. They would rather have weekend viewers than purists who read the magazines, blogs and sites during the week and so have some understanding of the sport. Which is where blogging comes into all this. With the abandonment of hope in the team owners, we are left with only the media as any sort of counter to the nightmare visions of those who think they own the sport. And the blog is perhaps the most effective means of spreading discontent with the direction desired by the greedy; certainly, it is able to say things that the traditional media dare not and so becomes a thorn in the side of the FIA and FOTA. Yes, it is a small thorn at the moment and only Max professes to read any of it, but there is no doubt that the internet is growing in power and could be the source of huge embarrassment to the F1 governing bodies in the future. The real power lies with the people. Were they to stop watching, F1 would crumble into a shadow of its former glory and the money men would suddenly find themselves in debt up to their eyebrows. At the moment they feel omnipotent, as though we will continue to watch whatever nonsense they serve up, but that is a short term view at best; there will come a time when large numbers give up on the sport as it is dragged into the arena of the circus. It lies with the media to continue to educate new fans as quickly as possible. What Bernie and his ilk do not understand is that the casual F1 fan soon becomes an enthusiast, that the number of informed fans is growing along with the increase in television viewers. That explosion of true enthusiasts is fueled by the media, especially the blogs, and the onus falls on them to safeguard the future of F1. F1 Fanatic recently posted an article on the number of GPs viewed by its readers. The overwhelming majority of answers came from fans who have been watching for less than twenty years - F1 has a young and knowledgable fanbase and this is its strength for the future. If they are to be heard, then it is the blogs, with their capacity for interaction, that will be their voice. We argue over the tiniest details, supporting one team or driver over another, but, when it comes to the big issues of what is and is not appropriate for F1, we are generally of one accord. That amounts to a powerful message to the governing bodies and they do not listen at their peril. If we are talking of the future, the F1 blog is every bit as important as the opinion of Martin Whitmarsh or Luca di Montezemolo. Let us hope that the big names become aware of the internet before it is too late. They fob us off with team sites that are largely propaganda at the moment but perhaps they might wander beyond that one day and come across the voices of those who keep them in business. There is an old saying that he who pays the piper, calls the tune - and it really is time that F1's paying clients started to call a tune or two. Gosh, a rather depressing outlook, Clive. I get a "abandon hope" kind of vibe from your latest comments. Depressing, yes, Don - but tremendous fun to write! And there is some truth in it, at least. If the governing bodies continue to ignore the wishes of their audience, they will fail in the end. And hope must lie with the fans for they are the only ones talking any sense at the moment. Don't get me wrong. I mostly agree with what you said. It's just a bit depressing to realize just how screwed-up the sport has become. Speaking of fans, there's a fan survey being conducted by ING. Check Autosport.com for the link. If enough of us make our feelings known it may have an effect on the future of the sport. Or not, if Max stays in power. Interesting reading! but like all the other blog posts I've read recently about the state of F1 and how ridiculous the suggestions for this that and other is, not one has actually mentioned there thoughts on how to make the sport better/more relevant/ more exciting etc. Don't get me wrong I love reading the F1 blogs cause there the only place opinion is really stated I just wish that instead of all the blogs pointing at the problems and screaming "That's wrong" they would make a suggestion themselves, put it on the line to be ridiculed/discussed like FOTA have done. The steam had only just stopped coming out of my ears after Valencia and then Spa happened.For my own sanity I had to understand what was going on,I spent hours and hours searching for answers and getting nowhere.then I stumbled upon your blog `more thought`s on Spa`and I couldnt believe what I was reading,someone actually telling me all the answers I was looking for in a concise way,no pop ups,no pop unders,just pure facts.So for me Clive the beauty of F1 blogs(I didnt even know they existed till Spa)is you can get to the bottom of subjects quickly,and you can get both sides of the story.FIA ,ignore bloggers at your peril,because out of Acorns mighty Oaks grow. hehee not to swell yer head Clive but you may have had some impact after all the aero rules are changing quite dramatically for next year. unfortunatly, I know that would lead to Ferrari & Mclaren jumping ahead again for the next decade or so because of the cost of development and who's got the spondoolix and experience on there side. Gusto: Thank you for your kind comments. It is always a good feeling to know that I have helped a little in increasing our knowledge of F1. And that is what I love about blogging - that the comments often add far more information and opinion than my original post has managed to include! I doubt the rule changes were anything to do with me, George, but the FIA's survey just might have influenced their thinking somewhat. And that is one of the strange things about FOTA's pronouncements - that they come at a time when F1 is heading in the right direction and we are likely to see more competitive and exciting races than we have for years. It just doesn't make sense that they should be talking such nonsense when the sport at last appears to be heading in the right direction. Your ideas would not necessarily allow Ferrari and McLaren to continue their advantage - money does not always win and there are some pretty innovative teams out there that would use more freedom for the engineers to come up with some great ideas. And yes, it really was three years ago that the FIA sent out their most recent survey. It's a pity they did not carry on with that annually. I hope you are right Clive and at some point the FIA listen to the bloggers and commenters. As you suggest at some point they will run out of new parts of the world to find sheep and therefore the educated will outnumber the novelty seekers. At that point if not before things will change. As to what should be done that is easy. There was a time when overtaking and good racing was commonplace and then it wasn't so all you have to do is turn the clock back to the point where the wrong direction was taken and start off in another direction. Wings need to be massively simplified or even thrown away completely as Gilles himself suggested. Jackie Stewart recently spoke of a race at Silverstone where he and Jochen Rindt swapped the lead around 30 times. Don't buy the theory that too much overtaking is boring. It isn't. Don't believe overtaking should be difficult. It shouldn't. If the driver in front makes a slight mistake he should lose his place. Sponsors like wings so there would be resistance to removing them. It would be easy to specify that a wing must be a simple curve of identical profile across the width of the wing so no complex swoop wings. Ban endplates and downforce drops massively. Let the drivers drive the cars and not electronics. There is no need for electronic accelerators and gearchanging. So let the drivers do that and reduce the cost to new teams. Reduced fuel levels and fixed fuel levels sounds like a good idea but we had them in the 80s and the racing was terrible. Drivers literally had a guage that showed plus and minus on it. Plus meant you had enough fuel to make the finish and minus meant you did not. In somecases drivers spent 20 laps conserving fuel to try and get into the plus side of the guage. They couldn't overtake and in some cases had to allow themselves to be overtaken. Finally on what should be done. Take KERS and driver adjutable aero abd bin it before it gets introduced. I saw a headline somewhere this morning but did not have time to read the article - it said something about an ex-F1 driver saying that a credit crash would be good for F1. I argued precisely that a while back and your suggested changes show why it would be good, Steven. With all the electronics thrown out, money would be saved and the drivers would have to drive again. Now there's a novel idea! But isn't the credit crunch EXACTLY the reason why we're getting such horrible ideas from FOTA? Because now, they're more concerned about taking money from us fans because sponsors don't have as much cash anymore. And how do they entertain fans? Well, they look at the series that's provided the most entertainment so far: NASCAR. One-million dollar shootout on Fridays? Sounds like a mix of the Budweiser Pole shootout and their All-Star Weekend to me. As it is, they seem to be looking at all the wrong places within NASCAR, when they have so much other stuff F1 can emulate (more driver exposure, better media coverage, among others). For years Ive thought `bring back manuel gear boxes`I blame James Garner in the film `Grand Prix`.Racing at Monaco He`s explaining how they change gear every three seconds,and after seeing an onboard lap of Monaco with Ayrton in a Mclaren you can only yearn for those days to return( coming out of the Station/Lewes hairpin changing gear while opposite locking,still brings a lump to my throat) There`s nothing like a smelly clutch to get your attention. NASCAR is seeing trouble out at the edges. Viewership is down, attendance is down, sponsors are leaving. Why is debated. Some say the cars look too much alike, except for the first and last foot or so, they are exactly the same. Some blame aero! The car in clean air turns better, so do you balance your aero for clean air or traffic? Some blame the preponderence of Charlotte like 4 turn ovals. The short tracks pack in every fan they can, while other tracks are losing fans so fast Daytona is considering closing some of the grandstands on the back straight. And of course the drivers are becoming more isolated from the fans. If this is F1's model, they better look closer. Drag Racing is a much better model. The cars are out in the open where any fan can watch the actual work being done between runs. The cars are difficult to balance and any competitor can overpower the track and be out on any run. And when my friend and I were walking through the paddock, he waved at top driver Brandon Bernstein, who was passing in a golf cart. BB promptly stopped and gave us autographs and chatted a moment about track conditions and how he was doing. Imagine any F1 driver doing that! You do the math. Lonny, you're right on the nail. That is surely one of the things that make me dislike Nascar. And one other thing is that the cars in the middlefield look more and more alike since their sponsors probably dont have as much money and they need to clutter their whole cars with tiny little advertisementstickers. 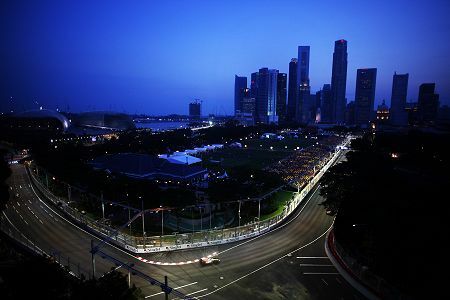 But that is also one of the strengths woth F1, the teams we have allready have the sufficient backing since they go through a kind of "financial check" when they pay up with the fees fo FIA and Berine Ecclestone to be able to race. You wont be granted a license if you cant pay up, and that the license cost much also grant that those getting involved with F1 is serious about their business. If you pay up that much, you wont get in just to participate in half a season. And i also have to reply to those ideas from our teamleaders again. There's no way they really can be serious about that. Af course the television companies have seen the potential and is running interviews with teams and drivers, historic reports, trackreports and anything that could be entertaining and mix it with a hefty portion of comercials. But that is not the way to deal with it from trackside. You simply can't count on people showing up to see a three hour training just co get to know who get's the 1000000$ price for posting the fastest time or driving fastest past a speedtrap. And i would sertainly not take a day of to go to a race just to see some clowns or a group of animals doing a show. Keep F1 clean and simple, and make as many as possible get to know the essential side of the sport. that will keep tye viewers, and make them talk about their beloved sport with their friends and neighbors, wich will spread the word and get more viewers to look. And Clive, finally back to you. I feel i could probably write an infinite reply to this post, mostly because there's no way to really describe just how important the F1bloggs have become. This is the only real way for an F1lover to get to state his thoughts and ideas, and in a real and free way sey exactly what's on his mind. That i also get to read a well informed and educated article about my sport a couple of times every week is also a great brake inbetween all the repetitive news i read around the net all the time. I think that more sites should take into thought the importance of having a more intimate way to speak to their readers. Theres no better reader that the one who feels he is actually a part of the things written about. And at a page like you'rs that is certainly the fact. And that is also why i objected so hard about that greenish blogpage you promoted so hard a while ago where alot of bloggers write to the same page. I mostly read about two or three bloggs a day, but to have a page presenting ten different bloggs on a single page is just to much. And one other thing that is lost on such a page is the personal side of it, because coming to a blogg should be kind of visiting a persons home, with it's own style and look. And that is completely lost when a group of bloggers write to the same page. It just don't get me revved up as much. The page beeing visited also tells a lot about the writer before i have even read the first word. And it is that first impression that makes me want to go back, if i dont like the walls and the roof of a house i wont buy it. And now to the importance blogging might have to the future of the sport. If what you writes about this is going to become true in the future, it makes me feel really sad. It makes me wish there could be some way for us bloggers to scream louder about the signs we see, and make the rulers of the sport hear us better. This is the place where the really deep analysis of the sport is beeing conducted, and i see us as the core of the sport. We are the ones who gives the result of that analysis getting a voice, and what good is a result of an analysis without a proper without a proper agent to recieve it? Now i feel it is time to drop the bomb, because this is what is about to happen as i see it. The leaders, owners and guarding bodies in this sport are beginning to forget it's audience, and instead starts to look at us as just a wallet with alot of money in it. Their problem is how to extract as much of those as possible. But that is also where their plan begins to falter, because more and more of the viewers are getting better and better educated about the core of the sport. Wich means there is more and more people who wants to have their say, just look at the steadily growing stream of people visiting this page. So, the future of the sport lies on pages like this one, where people can speak freely and hopefully there will also be people here soon who also read what we say and can and want to influence the sport. This is the only possible outcome of the sum of conclusions i can come up with. I mean, there's only so much time in a race weekend, and both the drivers and teh audience needs some time for them selves. You cant ocupy the whole weekend with activities 24 hours of the day. That will take the edge out of the competition, and when the raceday comes there wount be any audience because they will be at home sleeping. For the future of the sport to get stronger, consentrate on the racing, and give us better and better racing, not more to do between the races. I agree with you Clive, that F1 finally is going in the right direction, but i disagree that this could possibly be the result of some 3 year old petition run by the FIA. Isn't that to have just too high thoughts about them? They are the ones wo seem to forget their own rules in no more that 14 days. And back to me, as you say, Björn. Firstly, I must agree with Journeyer that the driving force behind FOTA's ideas is the need to save on expenditure and increase income. And it is indeed NASCAR that they are looking at in their search for ways to achieve this aim. Lonny has pointed out that all is not well within NASCAR, however, and that FOTA seem to be taking the wrong lessons from it anyway. Accessibility of the teams and drivers is the real point and the one on which NASCAR scores heavily - all the sideshows and razzmatazz are merely froth that has little effect on the fans. The matter of what F1 has to learn from NASCAR has been looked at on this blog before and dealt with fairly extensively on Keith Collantine's F1 Fanatic too, so I don't want to do yet another post on it. But what is seldom realized is that there is an important difference between the target audiences of the two sports that must affect any attempt for one to learn from the other.